I awoke to my birthday this morning and was presented a beautiful card my 10 year old daughter Maia made for me. The Jupiter, M66 and Saturn were sketched from pictures she saw in the book “Astronomical Sketching”. Happy Birthday! And, I agree. That is a fantastic birthday present! It probably is the best ever. It’s also well executed. I particularly like the festoons in the band of Jupiter. How wonderful is that? 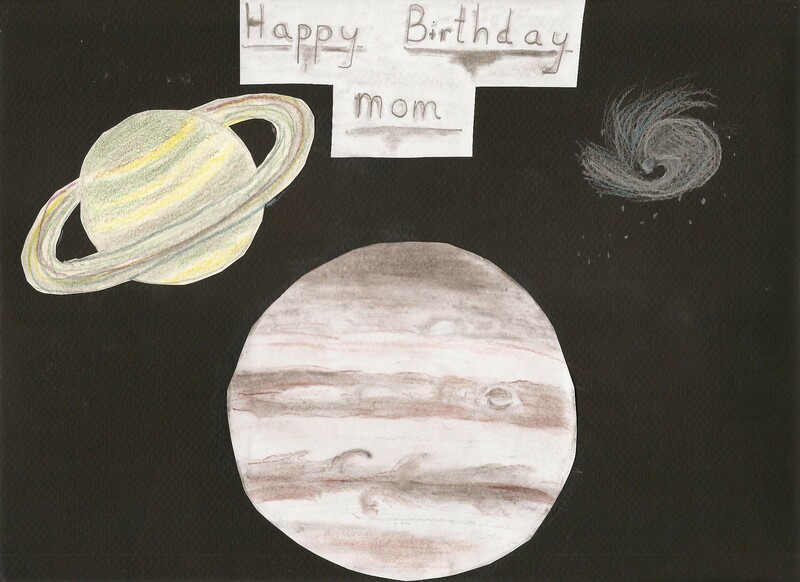 There is nothing quite so good as an astronomical birthday card to make your day. Very nice art work by Maia. What a great birthday present … and well sketched too !!! Thanks everyone for your Birthday wishes. What a special day it was! I’ve been lurking here for some time… This card got me to sign up just so I could reply. That card is absolutely beautiful, in more ways than one. BTW, is Maia named after the Plead? Yes, she is, but she does not have 7 sister!